Between right now and the last time I posted here, I wrote 32 drafts of posts I either forgot about or decided were terrible and then sort of thought “whatever, I give up, I AM TERRIBLE,” and then ate my way into a new pants size. The timing of the new Adele record was ideal because it hit me right at peak-wallow, and let me tell you, you do not want to read the Hello-inspired blog post I considered somewhere around the third week of December. But things are looking up. I’ve reignited my relationship with MyFitnessPal, which means I – once again – have a handy, non-human place to direct my contempt. I haven’t eaten cheese in four days, which has been hard but necessary. And I got a few work-appropriate sweater-dress/leggings outfits for Christmas and they’re making the bloat a lot easier to hide in this lumpy post-holiday interim. And I have a few new recipes, including this one from my lovely, wonderful friend Swarni whom I bother every day at work. Swarni is an essential member of the office potluck team, and a harsh critic of any Indian food brought into the office that isn’t up to her exacting standards. 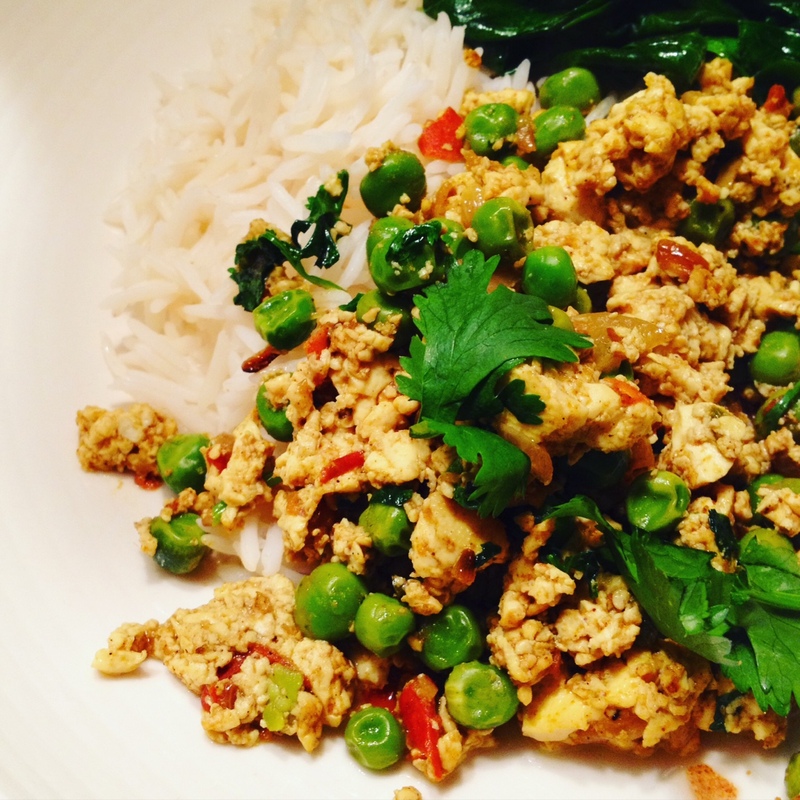 She brought a big dish of her tofu bhurji in for a holiday potluck in mid-December and it was so good that I spent the rest of last month haranguing her for the recipe. I ended up adapting the recipe a little bit, as Swarni gets her spices ground fresh when she’s in India and so they’re more potent than mine; I also use a bit of turmeric for more of an eggy colour. It’s a very mild dish and good for children (even mine, praise Swarni! ), but if you like things spicy, a little (or a lot of) hot sauce works well here. Tofu bhurji is perfect for weeknights, and January when we have no money and pretty much just fridge scraps with which to feed ourselves. I’ve used butter here, but you could easily turn this vegan by simply replacing the butter with a bit of oil. It’s a bit like scrambled eggs, in the end, but with none of the fart taste that so often accompanies a poorly scrambled egg. It’s magic, and it’s not cheese which, just this once, is a very good thing. In a large pan over medium-high heat, melt butter and stir together onion, jalapeño pepper, and ginger. Cook for about a minute, until the pepper brightens in colour, then reduce heat to medium-low. Stirring regularly, cook for seven to 10 minutes, until veggies have softened and turned golden. Meanwhile, mash tofu with a potato masher, or use your hands to crumble it until it resembles curds of scrambled egg. Set aside. Add tomato, garlic, curry powder, salt, garam masala, cumin, and turmeric to the pan and cook for another three to five minutes, until the liquid from the tomatoes has mostly disappeared and the contents of the pan resemble a soft paste. Add frozen peas, and cook for another three to five minutes, until the water from the peas has mostly disappeared. Add the tofu to the pan, and mix well. Partially cover the pan and cook for another five to seven minutes, stirring occasionally. The pan should be mostly dry on the bottom, and the tofu should be evenly coated in spices. Taste, adjusting seasonings as needed. Stir in chopped fresh cilantro, and serve with a blurp of your favourite hot sauce and rice or warm roti bread. Would even be good on toast, come to think of it. And Happy New Year! I hope your 2016 is delicious and everything you hope and want and need it to be. < Previous Hachee with beer and apples. Next > Gezellig, and a spot of mustard.